This page is dedicated to helping you navigate the different options you have. Also, be sure to see the Race Weekend Overview page for the bigger picture that you're planning for. If you accomplish these, then you’ve succeeded! Here are the most common ways to run the 2019 race venues. To understand why, keep reading to the end of the page. ​Many of us will pre-ride friday, join the team for dinner, and overnight in a hotel in Salinas. A few might drive down and back friday and saturday, and overnight at home. 5 - Six Sigma Again! Most will drive back Sunday, arriving home quite late. A few of us will stay overnight Sunday in a hotel and drive home Monday morning. When do I need to book my Hotel? It really depends on the venue. For Fort Ord, Laguna Seca, and Granite Bay, there are lots of hotels nearby, you can book whenever you want. For Six Sigma and Tehachapi, there are not nearly enough hotel accomodations for everyone that wants them. Remember that around 900 students race at every venue (400-500 per day) and so small towns fill up fast. So if you think you might want to go to these races, and you want a hotel, book the hotel now (or as soon as the schedule is announced). You can always cancel it. Your pre-ride options are simple. ​Some people will skip pre-ride, but this never goes well. They either crash the first lap, or go slow as they learn the course. The faster the racer, the more likely they will crash. If you race without pre-riding, we will tell you to take your first lap as if it is your pre-ride. In our experience it is always faster to do this than to crash. Pre-riding the day of the race works pretty well for girls who can also use it as their warm-up before their race. Many girls pre-ride the day before AND pre-ride the morning of as a warm-up. Pre-riding the day of is the only choice for those who were unable to get to the race venue the day before. When the race is on Saturday, it can be tough to get out of school early enough to get to the race venue early enough to pre-ride on a friday afternoon. For those who pre-ride the day before the race, most will join their friends on the team for dinner. This has always been a lot of fun in the past. Some people who can’t make it in time for the pre-ride the day before will still come down in time for the team dinner then stay overnight in a hotel. Some can’t make it in time for pre-ride the day before, but will still come in time for the team dinner and hotel or camp overnight. This lets them sleep longer on race morning. Whether you camp or hotel, staying overnight makes the weekend a lot more relaxed. This is primarily because it means you don’t have to get up as early on race day, even if you plan to pre-ride in the morning. It’s nice to be close to the race venue! Hotels are nice because it’s a warm comfy bed and a shower. The downsides are that it costs $100-$170 for the hotel room, and it means you have to manage your race bike for the overnight. For most of us, this means we keep our bikes in the hotel room with us and sometimes that means we have to clean them after the pre-ride. When the race venue allows camping on-site, a lot of people camp. It’s usually free, it’s a fun hang-out with the team, and it means you get to sleep in longer in the morning. The downsides are that there is no shower, no water (just porta-potties), and you’re sleeping on the ground. So it depends a lot on how much you like camping. Some parents will leave their kids (and bikes) at camp, and go stay in a local hotel. Some will bring (or rent) an RV. At Six Sigma, the venue is so remote that the limited hotel accommodations in Clearlake and other nearby towns are often full weeks in advance. Some people will use airbnb and vrbo and find a place to stay that way. People may do that at Tehachapi too since States is such a big event with around 800 people all racing on the same day. 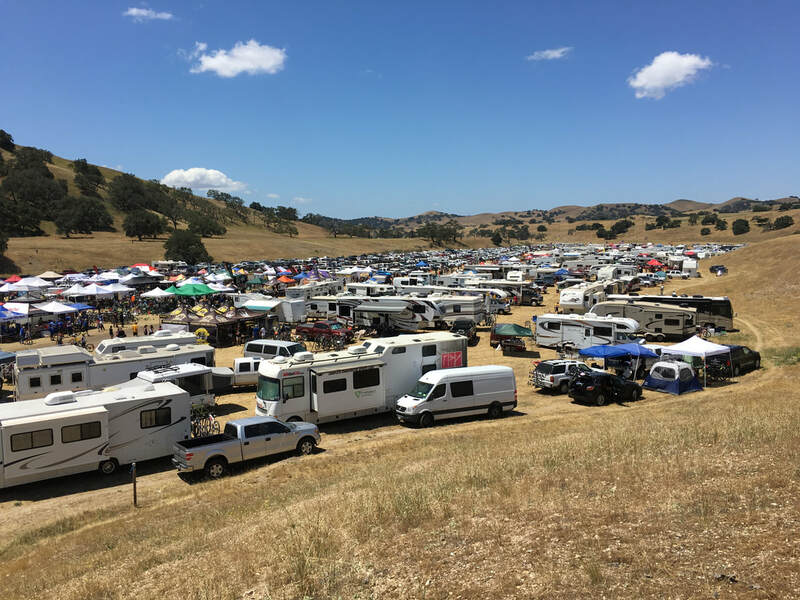 Sure, you can camp near Granite Bay, but no one ever does it because it’s not at the race venue. It’s a lot of extra work and stuff to camp, but it’s worth it when you’re on-site. When you’re on-site, parents pitch camp while kids pre-ride. On race day, you can pack up camp after your race. When you’re off site, you end up pitching camp late - after dinner. Then you have to get up extra early on race day to pack up camp. For all that extra work, you get to... sleep in your tent. Yay! Those who don’t mind getting up extra early and are looking to save money and/or time always opt to just get up really early and drive from home on race day because it’s a lot less work and you get to sleep in your own bed. pre-ride the day before, arriving as early as pre-ride is open - around 2 or 3 in the afternoon. join in for the team dinner. when there is on-site camping, The kids will camp, but we have reserved a hotel, which we may cancel at the last minute and just camp. Tehachapi - kids camp, parents hotel at Best Western Plus Country Park Hotel. For Tehachapi, we have reserved the hotel for Saturday AND Sunday nights.